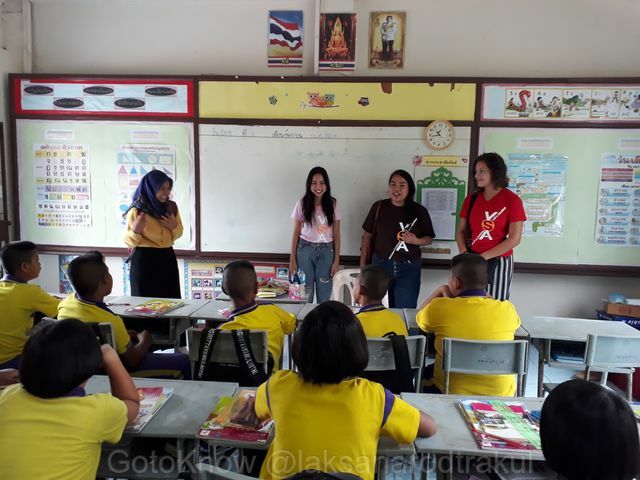 New MLTV Aline Van Roey from Belgium for MLTV1501 Peace Village - Songkhla, and ongoing MLTV projects ; Chiharu KIMOTO for MLTV1101-1 InterCutural and Language (ICL)-Songkhla is her 6th Month, Daiki YAMASAKI for MLTV1303 Folklore museum on Yo Island - Songkhla is his 4th Month and SATO Takumi for MLTV1507 InterCutural and Language (ICL) - Nakhon RatchaSrima is his 4th Month as well. There are 11 Indonesian Secondary school students with 2 teachers, one IIWC Campleader and Jam VSA Campleader. Cooperated with Institute of Non Formal and Informal Education Southern Region. There are two international volunteer and two local Thai, one MLTV with one Thai Campleader. Andrea from Spain, Nara from Japan , Nirat from Thailand, Ben local student of Non formal Education, Aline Middle Long Term volunteer from Belgium just join part time and Jam VSA Campleader and staff and Of course our great local partner Teacher Surachet of Institute of Non Formal and Informal Education Southern Region, Pi Tee ToTea Farm and Bang Lee for local fram visit. There are three Thai volunteers are going to join workcamp abroad in Septenber. ยเรียนรู้เกษตรกรรมปลอดสารพิษ ร่วมเรียนรู้และส่งเสริมด้านการเกษตรปลอดสารพิษ เพื่อเรา เพื่อโลก Learning and Supporting Organic Agriculture for us for Earth!